In Set List, we talk to musicians about some of their most famous songs, learning about their lives and careers, and maybe hearing a good backstage anecdote or two in the process. BoJack Horseman is a difficult show to describe on many fronts, not the least of which is because it’s an animated comedy about a universe filled with anthropomorphic animals alongside humans that deals with tough subjects like substance abuse and depression. Despite those topics, the show somehow manages to be very, very funny as it follows the misadventures of its title character, a star on the popular ’90s TV show Horsin’ Around, who now tries to carve out fulfilling relationships in Hollywood (sorry, Hollywoo) after a lifetime of dysfunctional interactions and failed friendships. Adding to BoJack Horseman’s irrepressible mix is its score and compositions, like the Horsin’ Around theme song and the Britney Spears-inspired hit “Prickly Muffin.” Last season, a wordless, underwater episode had only its lovely cinematic score to propel it forward. This season’s second episode, a look back on BoJack’s roots, hinges on the lovely “I Will Always Think Of You,” sung by Jane Krakowski, Colman Domingo, and Lin-Manuel Miranda. Composer Jesse Novak is responsible for all of BoJack’s songs and its score (except for the opening song, by Patrick and Ralph Carney, and the closing “Back In the ‘90s,” by Grouplove). He started out composing for TV on The Mindy Project (starring Mindy Kaling, the close friend of his brother B.J.) before moving on to BoJack, for which he often only has a day or so to compose something. And yet, as this current season shows, Novak’s contributions just seem to be getting stronger. Novak took a few minutes to go over some of BoJack’s greatest hits for us. The A.V. Club: Was The Mindy Project your first foray into writing scores for TV? Jesse Novak: I had done tons of media before, but I hadn’t done a 20-minute show before. I had done some full-length, very, very small—like, nobody ever saw them—movies, and a lot of stuff on the internet, different styles of commercials and stuff like that. As far as scoring to picture, The Mindy Project was me on TV and right away on Fox, because that was the network at the time. So that was a big jump from everything else. AVC: How did you get tapped for BoJack Horseman? JN: It probably had something to do with the fact that I went to college with the creator, Raphael [Bob-Waksberg]. We used to do sketch comedy together. We worked together before. When I heard that he had sold his show, I was super excited for him, and I never do this, but he’s an old friend—I reached out to him directly. I said, “If there’s any way I can be involved, please let me know.” And I did not hear anything back, and I was so sad, and then I eventually got a call from the music supervisor on the show. He said, “We’re looking at composers and your name came up. Would you want to demo?” I said, “Of course I do.” I came in, I met with them, I sent them music demos. I was also, you know, not only a fan of Raphael but also I’ve been a fan of Lisa Hanawalt for years. I love her books, I love her style. Just from the 10-minute pilot presentation, I felt like I connected to the show right away. A lot of the music I feel I continued in the show I started in that first week demoing for them because I felt that inspiration for a lot of the sound came from the visuals and feelings that I was already familiar with through Lisa and Rafael’s work. AVC: You do a spot-on parody of the dumb sitcoms people grew up with with your theme songs—like the Horsin’ Around theme song. JN: Horsin’ Around, I think of as a collaboration—somebody, at a really great moment, took a voice recording of Raphael singing a really crude version of it. It sounded very spontaneous, and it doesn’t really sound like the final product, but he had most of the lyrics down, and he had a sense of the rhythm of it. And I had that to go on, and I had the script. That’s so much better than having nothing to go on. I work best when I have a very loose outline, straight from the horse’s mouth, as it were. And so I think because I knew something about the sentimentality of the Horsin’ Around show in contrast with the darkness of Hollywood and everything—that was something that I knew was going to be recurring. I set out to make it extra heartfelt and extra mushy, but also very, like, macho. I spent a lot of time on that vocal—I really wanted to do it myself. It wasn’t easy for me to get that tone, but I really wanted to, so I did so many takes and so much editing. I think I eventually found the right quality and made it funny. AVC: “Kyle And The Kids” is another version of that, another perfect family that BoJack isn’t a part of. JN: That gag came in this really organic-seeming way in the writers room. I got notified that they were doing this scene, and I sort of knew the outline of the episode. All of a sudden, I heard, “We’re trying to pitch this joke: She says, ‘I can’t wait for you to meet Kyle and the kids’, and we’re thinking about going into a whole sequence.” And this was kind of late in the production—later than it normally would have been—so I said, “I’ll give it a try.” And they liked what I did, and then they did that sequence, which is great, because I think at first it was a maybe. I think it’s terrific—I think it’s a great way to break down the storytelling mechanism and get a little bit surreal and take us into BoJack’s head a little. And it’s fun for me to get to do kind of a rival show to BoJack’s show. I got my friend Carrick [Moore Gerety] to do the singing; he’s got a really sweet, really upbeat voice, and he did a perfect job. There’s harmonies, and there’s all these—just trying to make it extra perfect and extra happy. I wrote those lyrics, too, but, again, I got a note from Raphael in the middle of it: “Kyle And The Kids—you know, Charlotte’s his wife, and they have a kid named Trip”—he basically just gave me these super loose—and then I thought, “Oh, the funny thing would be to keep the lyrics almost as loose as that.” I just tried to make it descriptive and really upbeat and to play to comedy. AVC: You’re not directly thinking of Full House and Family Matters and those shows when you’re writing fake sitcom themes? JN: I think as much as anybody who likes pop culture, parody is influenced by the dominant examples in the genre. I would hesitate to call it any one specific thing as an influence. I’ll come out and say this: To me, this is like me trying to do early Britney mixed with early Neptunes, because I feel like those were the two dominant forces in the late ’90s musically, or early 2000s. They influenced me a lot. And her character was supposed to be that type of teen starlet from that era—how can you not think of Britney Spears? So I took a small amount of inspiration from that. But, at the same time, I often simply [tweak] the pop culture references a little bit, just to try to make it read as comedy, too. So I did a stripped-down thing with it in the end. Editing the vocals together was the most interesting part. AVC: What’s that like to see the final product? Like, “Here’s this song I wrote,” and then you see it visualized. Are you ever totally surprised by what they came up with? JN: In a way I am. But they’re consistently very inventive. There’s so much comedy always going on in the background and in the visuals. So I think, “Okay, something funny’s going on,” but at the same time, my attention tends to be on the music. You could play me back a scene and say, “Okay, what did you think about that thing that happened?” And then maybe I missed it because I was picking up on “Oh, maybe I should have changed that note” or “Maybe I should have put a different song right there.” I have to be so focused on the music—especially when it’s my music. I want it to be perfect. But I would say that, if anything, I just feel flattered that people would take something I made and then use that as a springboard for some other art form, which is drawing the visuals and putting something on top of it, letting them help each other. It’s great, because I tend to be writing those type of songs before the animation is even close to finished. AVC: What about the generic songs over the three panels that stay the same? What did you draw from for those three? JN: Songs from the ’80s—I just start thinking about the instrumentation, and I have the lyrics in front of me. So maybe I’ll start making a beat while I’m saying the lyrics in my head. You can really draw from clichés, and I’m the type of producer that pays a lot of attention to musical trends and things that signify the era. The ’80s are extremely distinctive, obviously: the use of synthesizers and drum machines, and the fact that people were just having so much fun with that technology. So you go in and you want something that’s very dancey and sounds very obviously like synthesizers—you could put a guitar in, but I think the synthesizers will read very quickly as ’80s. And I try to make it fun. Generic ’90s grunge song—I feel like it writes itself. I just tried to play some chords and I end up making it a little more poppy than mopey, just because you want the scene to have energy. It’s too complicated to try to write a subtle, mopey song and then try to get Will Arnett to sing it for a comedy sequence that’s not even about the song. The music is funny, but the visuals steal the show. So I just picked up a guitar and played some chords and tried to capture a little bit of the guitar tone from that time. To me, it’s not real grunge—I was really into grunge. That’s the kind of music I would have felt was too pop in the ’90s, but now I feel like it’s good for that scene and it sells the joke. 2007: I think my confession is that I really borrowed more from 2009 but nobody noticed. I think the Auto Tune was part of the lyrics. The lyrics are “generically 2007 pop song”—and then I added the rap on. That’s me rapping kind of like a bad will.i.am or something like that. [Laughs.] I guess I’m kind of trying to channel some—again, I’ve only named one name and I won’t name any more. But I really am trying to make it generic in the sense that I’m trying to borrow just enough from one source so that I can borrow from another source and another source, so that it doesn’t sound too much like any one song, but because I really do want to convey the sense of that entire year of pop styles. AVC: Mr. Peanutbutter is my favorite character after season four. Maybe it’s because everyone else is so dark. He’s the only trying to help BoJack. I really appreciate that he has a theme song. JN: I appreciate it, too. I still try to play his song as a counterpart to BoJack’s song. He’s sort of introduced as a competitor from the beginning—BoJack being dismissive of his show. I wanted to try and give it a really different flavor. What would make BoJack feel threatened—what kind of show? I think the graphic designers who did the fake posters for the show were on the same wavelength as me. I think we both wanted it to be dorky, funky-fresh—trying a little hard to be hip. Influenced by hip-hop but in a slightly uninformed way. I have very, very, really specific ideas about the tone of that song and all the things that it was going to borrow from. And it was originally 10 seconds long—I didn’t know how I was going to make a full-length song, so I made a short clip. AVC: How does that work? JN: I basically have the whole L.A. Philharmonic! No. Mostly, I hire vocalists if I need them, because almost everything else I can fake on the computer, through synthesizers, through keyboards, through sample manipulation, through loops—I’m very techie in the way that I do things. And I’m a real perfectionist. I take great pains to try and make synthetic things sound realistic. Same on The Mindy Project, which is basically—it’s all an orchestral-style, an acoustic-style soundtrack, but, again, that’s on the computer. AVC: This season you have “I Will Always Think of You” with Jane Krakowski, Colman Domingo, and Lin-Manuel Miranda. People online were wondering if it was a real song from the ’40s, but it’s a song you wrote that’s perfect for that time period. JN: I worked with Lin over the phone. I came into the studio, and he was doing a remote voice-over—the same thing with Jane Krakowski in the same episode. It’s a little challenging compared to being in a room with somebody, because you don’t get to meet them and make eye contact. And sometimes you can’t hear their singing as well as you want because it’s over a phone. But he was a total gentleman, and he was super nice. He was making jokes and stuff—he did a good performance and was very easy to direct. He’s obviously very musical. There was a whole demo for the actors to learn that I recorded with the cowriter of the song, Rachel Kaplan, and she did the female part, and I did the male part. So we had demos going in—that’s what we usually do. The actors listen to a demo with me on it, and then they learn the part with my vocal demo, and then we record them like that. So really all I did with Lin was sort of directing, listening to the takes, saying, “Can you try this? Can you try that? Can you do it faster here, slower there?” It didn’t take a long time. And it’s a funny way of being starstruck, because it’s like, “Wow, I met this person today,” but you didn’t meet them in the flesh. And I’m a huge 30 Rock fan, too, so I was a little starstruck by Jane even though I didn’t meet her. AVC: That silent underwater episode probably took a lot of time, because all there is is your music. JN: Yes, it did take a long time. They allowed for more time in the production for me to write the score. I don’t think that I put any more attention to detail than I normally do. It’s just there’s so much more music. I felt like I somehow caught inspiration from day one and found a good direction that just flowed out of me—that thing that you always want to happen really did happen. It was a pretty easy writing process. I felt inspired. 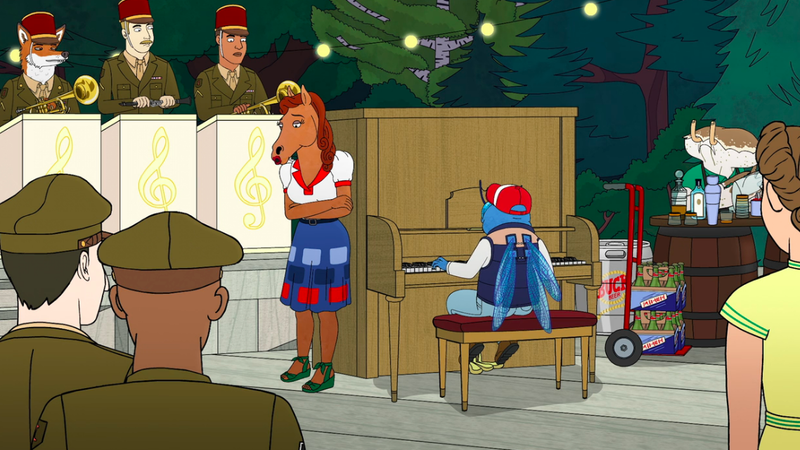 There was really only one scene where they wanted a rewrite of the music to add more energy to it, which was before [BoJack] gets on the bus full of fish. He’s walking the streets, and there was a note about—because I made a score that was a little bit sleepy and dreamy and it didn’t quite match all the action. They wanted it to feel like a very bustling city and not just a dream sequence, so I made some music that had more of a driving beat, and that was it. Basically, I just went straight ahead with the score, and it took longer just because there’s more areas to cover and more mixing to do and more stuff to be aware of. There was another rewrite, too. When he’s flying out of the factory and it’s kind of triumphant—my first draft of that music was not well-received. I don’t remember what they said, but it was a no. [Laughs.] I just redid it completely and then they liked it, and I liked it better, too. AVC: Is there a BoJack song that you love that people don’t mention that often? JN: “Every Dog Has His Day.” It’s not that loud, and I could see why people might not notice it. In season two, episode two, in the last scene, when Mr. Peanutbutter is saving Todd from the burning roller-coaster—again, this was based on a simple creation by the showrunner. He said, “We need a song called ‘Every Dog Has Its Day’ that has sort of an inspirational, heroic vibe.” I said, “Okay!” I had so much fun making that song—the singer was this guy from Craigslist named Mark Murray, who did a great job. It’s just a vibe that I love. It’s somewhere between “That’s What Friends Are For” and something by Boyz II Men, but with a little bit more of a power ballad feel. It makes me laugh my head off when I hear it. JN: It was another late-night request—another late addition to the episode. Somebody said, “Can we get a song like this by tomorrow?” And I said something like, “Okay, I’ll give you a really rough demo, and then I’ll rewrite it.” And the demo is almost identical to the finished song. And of course I was thinking, “Whatever, this is just temporary.” Sometimes when you do that, you inadvertently end up with something that has the right feel. And the song really did have the right feel. I cleaned it up a little bit, and I ended up doubling the vocals with my friend Carrick, who also did “Kyle And The Kids,” so it’s actually two male singers on that song, mixed together. I guess, if anything, the story of that is the story of something happening where you didn’t intend for it to be the final product but ended up loving it and noticing that other people seemed to love it, too. I knew the tone of the episode, too. And their relationship [between BoJack and Princess Carolyn] has always touched me in a way as bittersweet and strange. So the background of the characters helped the song come out of me, and I put a lot of sincerity into the music when it’s instrumental. Maybe as far as the funny songs go, that one comes from a sincere place, too. AVC: You have to be creative on such a tight time limit. Do you find it gets easier as you go? Like a blade that gets sharpened? JN: I feel the same way, especially because you can see things actually take less time as you go on. For example, The Mindy Project music: Every year I’m writing it faster, and I think it sounds better. And so that’s just about sharpening yourself. But as far as having to write on a deadline, it’s good for me—I’m a real tinkerer, and I’m a real perfectionist. It’s really hard for me to know when something is finished without a deadline. But when I’ve got a job to do and people are counting on me, it’s, “Okay, there it is! Here’s your music.” Because it has to be finished, so you finish it. It’s really hard for me to know when something is finished without a deadline. I have a lot of unfinished music sitting around, waiting for someone to finish it. What’s a TV theme song you like on a show you don’t?